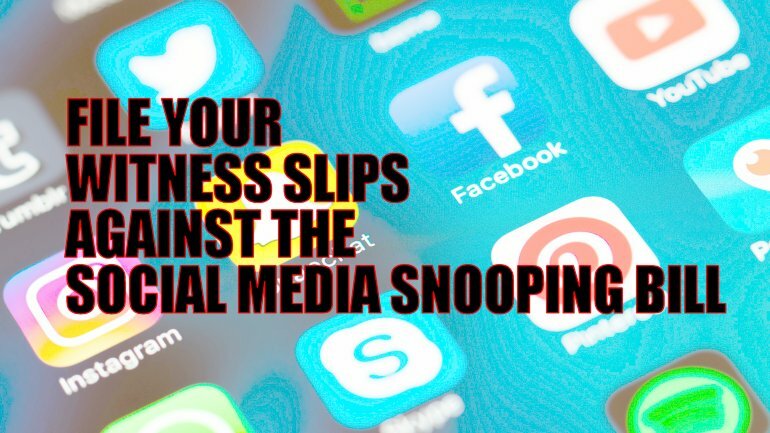 WITNESS SLIP: Social Media snooping bill at hearing Wednesday. Daniel Didech, the freshman Democrat state rep, introduced the social media snooping bill a couple of weeks ago. We covered it within a day or three of its filing. Since then two other political hack Democrats have signed on as sponsors. The national media has started picking up on the absurdity of his intrusive proposal, mocking it rather roundly. After all, the Illinois ACLU people don't want the Illinois State Police snooping around their (hypothetical) Swing Lifestyles, Tinder, Grindr, and PronHub social media accounts and all the naughty pics and videos therein. Any more than the rest of us want some $15 an hour political patronage state worker snooping through our private social media accounts. Gun rights activists will certainly welcome the ACLU’s unexpected help in opposing a grossly unconstitutional proposal to the already unconstitutional Illinois Firearms Owners Identification Act. After all, just imagine a similar investigation carried out before issuing a permit to attend church. Or to vote. Frankly, this bill is destined for the House Rules committee or some other place where it shall languish until the end of the 101st General Assembly session. And frankly, Daniel Didech needs to be reminded of his grossly intrusive, ludicrous proposal until he's voted out of office in the next election. HOWEVER: It has been assigned to a House committee hearing this Wednesday and you know what that means! It means you can register your witness slip in opposition! CLICK HERE to fill out a witness slip in OPPOSITION to Didech's social media snooping bill. CLICK HERE to see who else has filed slips. As of a minute ago, there's exactly zero slips supporting intrusive snooping of social media accounts. This entry was posted on February 9, 2019 at 7:09 pm and is filed under Blog. You can follow any responses to this entry through the RSS 2.0 feed. 6 Responses to WITNESS SLIP: Social Media snooping bill at hearing Wednesday. Telling my friends who believe in our rights under the 2nd Amendment they need to put one in for this as well. Even though I'm not on Fakebook, Tweeker or Instascam. I'm quite sure that many forums are being monitored as well. Old Sarg, he could be a one termer. If he is, he'll still wreck Illinois. Wasn't Illannoy wrecked a long time ago? I am surprised "King" Madigan let this 'train wreck' of a bill get to the rules committee in the first place……but then again the 'commie'crats do control the state.